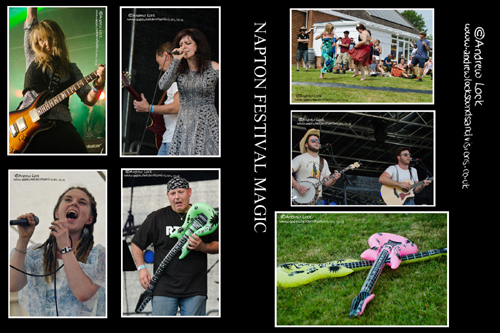 One of my favourite festivals of the year is just around the corner, this years Napton Festival takes place on Friday 10th and Saturday 11th July. A usual the action takes place in the grounds of the village hall, gates open at 4pm on the Friday and artists include punk rockers Electric River and The Jellyheads with Folk/Pop outfit Man Made Moon and popular Coventry band The Session making a return after last years top quality set. On Saturday gates open at 11am for a full day of live music and a cracking bill includes one of my personal favourite artists Kristy Gallacher, singer/songwriter Nina Baker and female fronted rockers Derecho a band also returning after an amazing set last year. To close this year they have gone for Abba Chique and this should be a fun way to finish off the festival with all the Abba classics to sing the night away to. The Acoustic stage also makes a return this year on the Saturday afternoon and as usual plenty of food and drink outlets and stalls will be found around the festival site.